Build your friendship stronger with your best friends on the occasion of Friendship Day by surprising them with the best Friendship Day personalised gifts. To add an extra touch of love, affection, and care to your gift, order personalized gifts for Friendship Day from a wide variety of gift options like photo frames, keychains, mugs, cushions, chocolates, cakes etc from FlowerAura. "There is nothing on this earth more to be prized than true friendship"- Thomas Aquinas. Truly, friendship is a special bond that lasts than any other bond. No matter what, a friend will always support you, encourage you, tolerate you, and accept you unconditionally. If you are also blessed with a dozen of good friends in your life then, celebrate their presence in your life on the occasion of Friendship Day. Yes, Friendship Day gives you a perfect opportunity to say those unsaid words and express those unexpressed feelings that your heart holds for your best friends. There are times, when your friends made you feel like a king or queen and felicitated you with the love, respect, and gratitude you deserve. Now, it's your time to reciprocate the same amount of love, affection, and care towards your best friends. If you are wondering how then, let us tell you that gifts play a big role in expressing the deepest emotions for someone. On Friendship Day, people buy friendship bands, flowers, greetings, chocolates etc for their best friends and marks the celebration of their friendship. 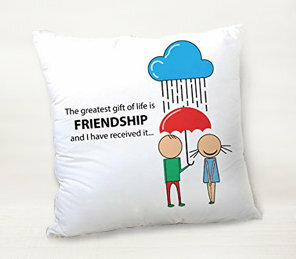 So, if you too are looking for a unique and thoutful Friendship Day gift for your best friend then, you are at the right place. We, at FlowerAura, brings to you a wide range of meaningful personalized gifts for Friendship Day that will surely convey all your love for your best friends in the most profound way. From personalized photo frames to coffee mugs online, we've brought to you the best personalised gifts for friendship day. When it comes to gifting your special ones, personalized gifts tops the list and so are they as Friendship Day gifts too. Because your friends are your near and dear ones, you would definitely wish to surprise them with something very personal on Friendship Day. Isn't it? So, there is actually a great importance in gifting something personal which will always remind your best friends of you. Therefore, giving a personalized present to your best friends on the occasion of Friendship Day will show that you care for them. The fact is when your best friends will receive personalized Friendship Day gifts from your end, they will value and cherish that present for their entire lifetime. Whenever you are give a personalized gift to your loved ones, it conveys your love, care, and affection for that person in the most beautiful way. Thus, choose the most special gifts for your best friends on Friendship Day becomes your friends deserve the best. With FlowerAura, you can personalize a wide variety of gifts like mug, key chain, photo frame, lamp, cake, chocolates, and cushions online from the comfort of your home. If your girlfriend is your best friend then, you can go for personalized gifts like mugs, cushions, photoframes, chocolates, magazine cover, teddy bear etc. And, if you are looking for Friendship Day personalised gifts for a guy then, you can go for personalized friendship mugs, keychains, bottle, table top, etc. Aren't these gift options thoutful and trendy at the same time? Apart from our wide variety of Friendship personalized gifts, we also provide an impeccable delivery service. Yes, when it comes to our delivery service, you don't have to worry about the on time delivery at all. To order Friendship Day gifts from FlowerAura, all you need to do is pick a gift from our collection and place your order. Once your order gets confirmed with us, our delivery team will provide you a doorstep delivery just within a few hours of your order placement.